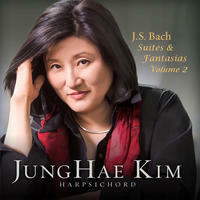 JungHae Kim : JS Bach Suites and Fantasias, vol 2. Johann Sebastian Bach's Suites and Fantasias is Ms Kim's virtuosic presentation of some of Bach's most challenging, rare and beautiful works for keyboard. The collection begins with the thrilling Prelude, Fugue and Allegro in E flat and then presents the beautiful unfinished Suite in F minor BWV 823, which exists only as a fragment. Throughout the remainder of the recording Ms Kim presents a feast for early keyboard enthusiasts, performed on a superb German instrument by John Philips after an instrument built in Dresden in 1739 by Johann Heinrich Gräbner; an instrument with which Bach is likely to have been familiar. The recording was completed at Skywalker Sound, insuring the highest sound quality possible. This collection therefore brings together rare and beautiful compositions by Bach, superior sound quality, a gorgeous and authentic period instrument, and the skills and talents of a remarkable artist. License Deeply elegant harpsichord by JungHae Kim for your project. Play the music of JungHae Kim in your restaurant or store. The Airs of Wales by Cheryl Ann Fulton: World-class performer and teacher of Medieval, Baroque, Welsh triple, Celtic and Concert harps. Sports football betting app: High quality open source OGG files. This is an open source audio format. It is a compressed (smaller file size) version of the original CD, and includes CD artwork and artist info. Works great on Linux, VLC and many audio players based on open source.